Story: In 1960s Detroit, a good night onstage can get you noticed but it won't get your song played on the radio. Here, a new kind of music is on the cusp of being born - a sound with roots buried deep in the soul of Detroit itself, where songs are about more than what's on the surface, and everyone is bound together by a shared dream. Curtis Taylor, Jr. (Jamie Foxx) is a car salesman aching to make his mark in the music business - to form his own record label and get its sound heard on mainstream radio at a time when civil rights are still only a whisper in the streets. He just needs the angle, the right talent, the right product to sell. 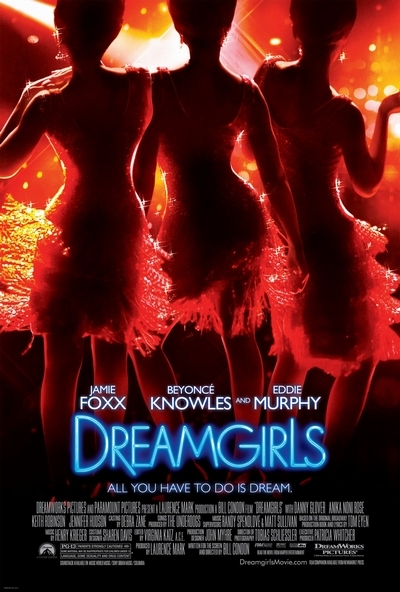 Late for their stint in a local talent show, The Dreamettes - Deena Jones (Beyonce Knowles), Lorrell Robinson (Anika Noni Rose), and lead singer Effie White (Jennifer Hudson) - show up in their cheap wigs and homemade dresses, rehearsing songs and steps by Effie's brother, C.C. (Keith Robinson), with hopes that talent and sheer desire will break them out of the only life that seems available to them. They're young. They're beautiful. They're just what Curtis is looking for. All they have to do is trust him. James "Thunder" Early (Eddie Murphy) is a pioneer of the new Detroit sound, spellbinding audiences all along the "Chitlin' Circuit" with his electrifying blend of soul and rock 'n' roll. Curtis finesses The Dreamettes a gig singing backup for Early, and suddenly, for all of them, the gulf between what they want and what they can have draws closer for the first time. Curtis launches the girls as a solo act, rechristening them The Dreams, knowing in his gut that success lies not with the soulful voice of Effie, but with the demure beauty and malleable style of Deena - despite their history...and Curtis' promises. Deena is ready to step into the spotlight, even as Effie fades away. As a new musical age dawns, Curtis' driving ambition pushes this one-time family to the forefront of an industry in the throes of music revolution. But when the lights come up and the curtains part, they hardly recognize who they've become. Their dreams are finally there for the taking, but at a price that may be too heavy for their hearts to bear. Jamie Foxx Curtis Taylor Jr.